It poured with rain this morning and when I announced that I was going to the supermarket - all of two doors away from the school - at lunchtime I was met with a chorus of, "You can't go out!" "Of course I can - I'm British", said I. Now, usually you can't get near the meat counter on a Friday as Sicilians, and Italians in general, buy an awful lot of meat for the weekend. Unlike the British, they do not buy a large joint and that is that - oh, no: it's a goodly amount of this, another kilo of that, "better take a mezzo kilo of that as well" and, just when you think the person in front of you has finished, they will think of something else that the butcher has to go into his workroom to cut. After that every one of them will want "un po' di salsiccia" - and who can blame them? - before they enquire after the butcher's wife, children, uncles in America, neighbours and plans for the weekend. If you can manage the wait, it will be worth it but sometimes I just can't. Today, however, was different, for the rain had kept even the most earnest shoppers away; I was served in double-quick time and it was smiles all round. As a bonus, later the Christmas lights came on in via Sacro Cuore [ which is more than happened last year] but I don't think many of the people who ventured out in the late afternoon saw them, as most were walking around with heads bowed and umbrellas up even though it had stopped raining hours before. I was reminded of football's favourite naughty boy, Mario Balotelli, who in this interview told Time that he "never goes out" in Britain because of the rain. One of the earliest posts I wrote on this blog, back in 2006, was partly about the public conveniences - or lack of them - in Modica and the condition of the facilities that did exist, mostly in bars, at that time. Four years later, I wrote this for Italy Magazine. I'm glad to say that the toilet seat situation has improved since then but there are still institutions and establishments that stubbornly prefer the seatless toilet because it is thought to be more hygienic. 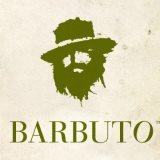 The owners or managers of these premises may like to take a look at this article from the BBC. In that early blog post, I said that bar staff in Italy as a whole are understanding if passers-by just need to use the bathroom but this is changing and in larger cities like Catania or other tourist spots you are now likely to see notices informing you that you are expected to buy something if you want to use the facilties. This does not bother me as I don't mind paying €0.80 for a coffee if I need to use the loo but I do suffer from a Brit's sense of bewilderment at the absence of public conveniences - you know, easily accessible toilets that are just toilets. The British, who, as the outcomes of recent EU summits have shown, consider themselves "different" from the rest of Europe, tend to believe that the public convenience issue proves it and have openly wondered for over a century whether their Latin neighbours have stronger bladders. "But people go to the toilet at home!" 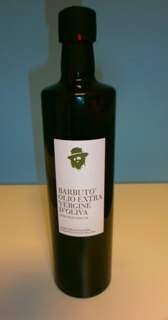 I was delighted to receive this bottle of this year's extra-virgin olive oil from my friends at Barbuto. The colour is sublime. I can't wait to taste it and I love the label, too! Il Sole 24 Ore has published its 2012 Quality of Life in Italy survey and has pronounced Bolzano the best of Italy's current 107 provinces to live in. The provinces were ranked according to 36 criteria in six categories which were: standard of living; business and work; environment, services and health; population; public order; free time. 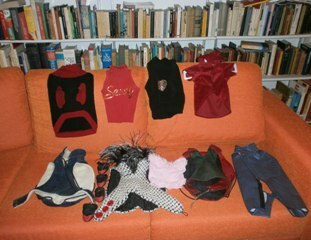 "In Bolzano you can breathe in an air of well-being, verging on opulence", said the journalist sent to the province. The province also has low unemployment , at 3.3% as compared to a national average of 9% and a low rate of crimes such as burglary and car theft. The tourist industry is thriving, too. This is not the first time Bolzano has come top of the list, now in its 23rd edition, as it was ranked number one in 1995, 2001 and 2010. Its citizens must be particularly pleased with themselves this time, as their province has toppled Bologna from its number one position and can lord it over Siena, which is ranked second. Bologna, as you see, has dropped dramatically in the rankings whilst Milan is ranked 17th and Rome 21st. Poor old Taranto comes last. Messina has dropped five places in the table, mainly because it fared badly in the business and work category. It had actually gained points in the standard of living category. 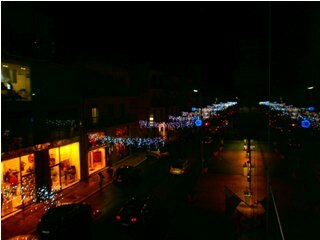 Ragusa has high unemployment at 9% and pensions are lower than the national average. On the other hand, house prices are also lower and, of course, the area has a lovely climate. It fares well in tourism, too but there are too many crimes such as car theft, pickpocketing and extortion. The birth rate is ten babies per 1,000 inhabitants annually, as compared with a national average of 9.6. I am happy to report that the number of bookshops in proportion to the population in the province is higher than the national average and that clinches it for me. So before you all rush to relocate to Bolzano, consider Ragusa! Back in 1965, the then British Prime Minister Harold Wilson appointed one Barbara Castle as his Minister of Transport and caused a sensation, firstly for having appointed a woman but mainly because Mrs Castle could not drive. I remember the fuss and ever since I have been amazed at the alacrity with which governments everywhere put people with little or no knowledge of a given sector in charge of it. Most people would not ask their lawyer to carry out dentistry so I've never understood why they are happy to allow decisions regarding their children's education to be made by men and women whose only experience of school has been as pupils. Yes, I would expect an education minister to have taught, and not in a Cameronesque private school or élite grove of academe! However, on the rare occasions when experts like Mr Monti's not-so-merry band of "technocrats" are appointed as government ministers, they tend to disappoint. I am convinced, as I've said before on this blog, that this is because such "experts" are usually well-off individuals with little understanding of the day to day struggles of those they are called upon to govern. Hats off, then, to Sicily's new Governor Rosario Crocetta who has appointed a young female student as Regional Councillor for Training: 29-year-old Nelli Scilabra is a law student at Palermo University, where she is a member of the Academic Senate. She is also Palermo president of Rum, the Mediterranean University Network. Ms Scilabra says that she knows what it is like to be young in these times and that she hopes to be able to help young people to stay in Sicily rather than leaving it, as so many feel they have to, in order to find work. The appointment is one of the latest to the "committee of intellectuals" that Mr Crocetta feels the island deserves in its regional government. ""At last", he says, "young people will be represented." It might just work and I hope it does. And what do Sicilians think of it? Before I wrote this post I voted in an online poll on a Sicilian newspaper site. Readers were asked to decide whether the appointments announced so far have pleased them not at all, a little, enough or a lot. I voted "enough" and found that I am with the majority of voters. [You can't see the number of votes until after you have voted.] Hope with a dose of Sicilian cynicism is the order of the day, then. 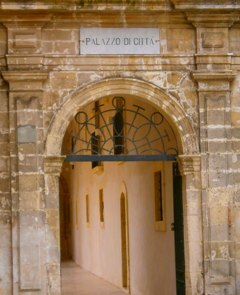 I was happy to bring you some good news about Modica on Monday but Sicilians' ability to shoot themselves in the foot was in evidence again the very next day when it was reported that 106 out of a total of 126 employees at the town hall had been regularly cheating their employer, the city council. The list of misdeeds is endless: employees were allegedly getting colleagues to clock in for them, going out to the bar or the hairdresser's during working hours, sitting in the car park listening to music instead of working and even, in one case, resetting the clocking-in machine. Some of these employees had already been under investigation for absenteeism. The Mayor of Modica has let it be known that he considers the Council of Modica to be an injured party in the case. Vergogna - Shame on those who have brought this lovely city into disrepute. Christmas doesn't really get under way here until the December 8th holiday and even then, there is little of the bustle and excitement we associate with the season in Britain. But you know it's getting near when you can hardly move in the supermarket for wall-to-wall panettoni. 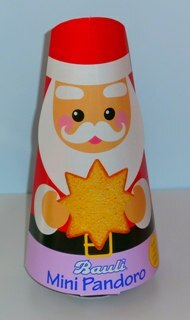 This morning I espied this year's Bauli mini pandori and they're so cute I just had to have one for my tree! 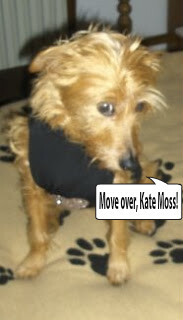 Hmm - do you think he looks a bit lonely and needs a companion? The inspiration for this comes from the involtini con pancetta e salvia recipe in this month's Conad supermarket chain's free magazine. Their involtini are made with chicken breast escalopes and filled with chestnuts and mirtilli [whortleberries]. Well, I can't stand chestnuts and couldn't find any mirtilli, so I used a mushroom mixture and what has accidentally become my ingredient of the month - pomegranate seeds. The Conad butcher, pleased that someone was going to cook something from the magazine - I didn't tell him of my sabotage plans - suggested I use skinless chicken thigh fillets instead of breasts and, although there were thin strips of pancetta already on display on the counter, he decided these were not thin enough and cut some more especially. This kind of service and advice always cheers me up and he hasn't been wrong yet! First, soften about 200 gr sliced mushrooms in 125 gr butter and add a handful of pane grattugiato or fresh breadcrumbs plus some chopped fresh sage. Stir well and take off the heat. Lay the fillets - I used 6 - out on a chopping board and spread the mushroom mixture over them. Distribute the contents of half a pack of pancetta dolce cubes over [about 85 gr] and sprinkle over some pomegranate seeds, a little ground cinnamon and about half teasp ground cloves. Add a few twists of pepper and some seasalt, roll up the fillets in 2 slices of pancetta each and secure with cooking string. Tuck a sage leaf into the top of each involtino. Brown them on all sides in 4 tablesp olive oil in a wide pan, then add a glass of white wine. When it evaporates, add 200 ml chicken or vegetable stock and some more pomegranate seeds. Bring to the boil, then simmer for about 40 mins, turning the involtini over after 20 mins. Take the involtini out and place on a serving dish and snip the string off, then quickly add a roux of a dessertspoon of butter and the same quantity of flour to the sauce. 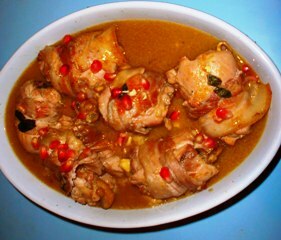 Stir to dissolve and thicken the sauce, pour over the involtini and serve. [You can slice them to serve if you like but I'm not good at slicing meat thinly and, in the absence of one of those meat-slicing contraptions that most Italian women have, would make a terrible mess.] Decorate with even more pomegranate seeds if you wish. The Michelin Italia Hotel and Restaurant Guide for 2013 is out and the South is chasing the North in terms of stars! Lombardy has the most stars in Italy with 50 one-star, four two-star and two three-star restaurants, while Piedmont is second with 32 one-star, five two-star restaurants and one three-star establishment. But look what happens next: Campania, with 27 one-star and six two-star restaurants, beats Emilia-Romagna [26 starred restaurants in total], Trentino Alto-Adige , Veneto and Tuscany [24 each] and Lazio . Puglia has five one-star restaurants while Calabria and Sardinia both have three. Sicily has eight one-star and three two-star restaurants and I am happy to say that the Province of Ragusa has done very well: Il Duomo di Ibla in Ragusa Ibla has two stars, the Locanda Don Serafino, also in Ragusa Ibla, has one and another star is retained by Ragusa's La Fenice in the Hotel Villa Carlotta. Lovely, Baroque Modica is not left out as La Gazza Ladra in Modica Alta's Hotel Palazzo Failla retains its well-deserved star. Only Taormina can rival Ragusa for Michelin stars in Sicily and the Principe Cerami in the San Domenico Palace Hotel retains its two stars, while single stars are again awarded to the Bellevue in the Hotel Metropole, the Casa Grugno [website apparently down] and La Capinera at Taormina - Lido di Spisone. A celebration dinner for the city's "star" chefs is being held in the Palazzo San Domenico Hotel tonight. In all, 307 Michelin stars have been awarded to restaurants in Italy for 2013. Claudio Baglioni - Tu come stai? Finely chop 2 shallots and soften them in a wide pan in 4 tablesp olive oil, adding a handful of pinenuts after about 2 mins. Add the finely chopped leaves of 1 radicchio - I chopped mine in the processor - and stir everything for about 5 mins. 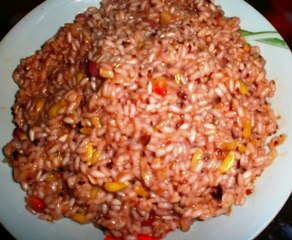 Add 500 gr arborio rice and stir that around too, then add a glass of white wine to the pan, stirring. Have ready 1 litre vegetable stock, add about a quarter of this and stir. Turn the heat down and let it absorb, then add another quarter and repeat the process until the stock is used up. It will take about 20 mins. At the end, season to taste and add the seeds of a pomegranate, then add about 100 gr grated parmesan, grana or ragusano cheese. Stir well, then take the pan off the heat, add a few knobs of butter and stir these in too. The pomegranate seeds will become mouth-burningly hot so let it stand for 3 mins or so, then serve in bowls. There was no shortage of pomegranates on the roadside fruit lorries today and they were all teeming with oranges. 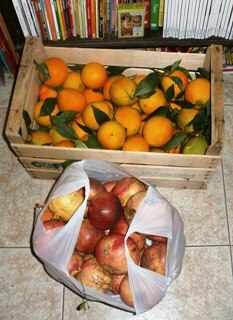 The fruitseller who calls me bambina carried these home for me. What better start to the day could there be? In a glass bowl, mix together 2 tablesp pomegranate molasses, 4 tablesp olive oil, the juice of a Sicilian or unwaxed lemon, a glass of white wine, 3 - 4 crushed allspice berries, a couple of grinds of mixed peppercorns, coarse seasalt and a few grinds of cinnamon from a cinnamon mill or a little powdered cinnamon. Add 6 drumsticks and turn them in the marinade. Cover the bowl with clingfilm and leave for a couple of hours or overnight if you can. 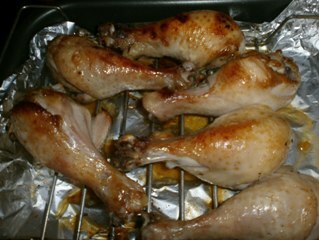 Turn the drumsticks over once during this time. When you are ready to cook, drain the drumsticks, discard the marinade and cook them on a rack in a foil-lined roasting dish for about 40 minutes at 180 C.
I had neither radicchio nor pomegranate seeds when I cooked these on Sunday but I think another time I'll serve them on a bed of dressed radicchio and sprinkle some pomegranate seeds over the top. That's what I've been having with the local gas board who have sent me an early Christmas "present" in the form of a truly enormous domestic gas bill. Admittedly I am not Sicilian enough to pride myself on not using the heating during the winter months but, quite apart from the fact that I actually think one's home should be comfortable, I do have asthma, arthritis and Raynaud's disease, all of which are aggravated by the cold. I've been a good girl and have paid my bimonthly gas bills upon their arrival all year so this extra one, for such a large amount, was a real shock. I am told it is a conguaglio or "adjustment" and have spoken to several other people who have received similar unpleasant surprises. Even though the gas company has agreed to payment in three installments, it is still an almost impossible amount to find in addition to payment of the new gas bills which will continue to come. This conguaglio is a scandal and, although Italy does not have as many competing energy companies as the UK, there are some. What we need here is a scheme like this one in Belgium and I might just start one. 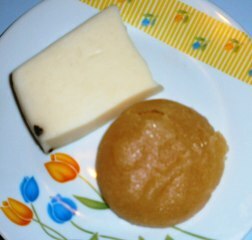 A hunk of Sicilian peppered pecorino and some cotognata [quince paste]. What could be better? The newly elected Governor of Sicily, Rosario Crocetta, appointed singer and composer Franco Battiato as his Regional Councillor for Culture on Tuesday, saying that Sicilians should love their land more, spend more on culture,work together to build a new Sicily and be proud of their identity. Franco Battiato, who was born in Riposto [Catania Province] said he didn't want a salary and initially gave the impression that he regarded the position as a part-time one as he didn't want to give up his music. This remark was seized upon by the media and it was soon being said that the singer was only going to be a kind of "cultural consultant". Today, however, Mr Crocetta made a further announcement in which he confirmed that Mr Battiato will have special responsibility for tourism and entertainment in the region and the singer says that he intends to organise events which will really put Sicily on the world map. Mr Crocetta has made it clear that he wants a "committee of intellectuals" to be at the heart of regional government in Sicily as "a place which doesn't value its intellectuals is doomed". Well, Barack, of all the honours you've received today I'm sure you'll be glad to know that your book made our timely display at the school. Sorry, Mitt, but I don't have one of yours. That may be just as well because your remark six days ago about not wanting the USA to "end up like Italy" went down about as well here as your pre-Olympics gaffe in London, though it did have the unexpected effect of uniting politicians from two warring parties [Italy's Pd and Pdl] in indignation. Minister Gianfranco Polillo, meanwhile, shrugged his shoulders as only an Italian can, concluding that you already have economic problems similar to those of Italy but lack the compensations of the Italian quality of life. Everyone I've spoken to here seems pleased at the outcome in the US and Mr Monti sent amicable and restrained congratulations to President Obama today, in marked contrast to those of his predecessor Mr Berlusconi four years ago when the gaffeur par excellence emphasised the then President-elect's "suntan". Mr Monti added that President Obama is "nice" to work with. I don't know about you, dear reader, but I feel worn out even though I haven't fought a campaign or cast a vote! Perhaps this is because just two weeks ago we had our own very exciting Sicilian regional elections, in which Beppe Grillo's new M5S party won 47% of the vote. So hold on to your hat, Barack, because we may have real change coming over here! This is the season for kaki, cachi or loti [persimmons or Sharon fruit] and, as I am always looking for recipes in which to use them, I thought I'd try the kaki and carrot cake featured in the October edition of Occhio alla Spesa magazine. 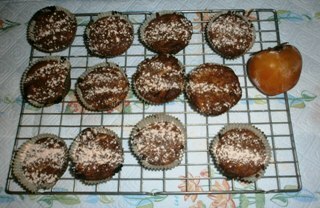 The recipe instruction was to bake it in one tin but the picture showed several muffin-like cakes, so I decided to use muffin cases. Cakes never rise magnificently in Italian ovens - at least, not for me - but these tasted good! It's "Blog for Peace" day and once again I'd like to thank the inspirational Mimi Lennox for the original idea and all her hard work. 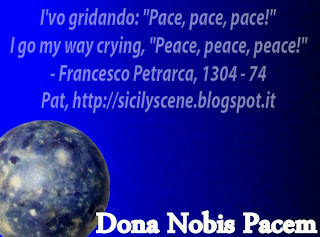 Mimi is a great writer so I hope you'll visit her blog as well as the Peace Globe Gallery. Have a peaceful evening, wherever you are. And whoever wins, may he work for peace. 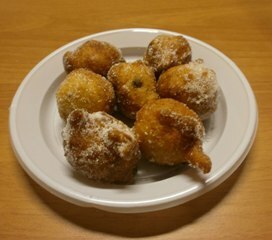 Frittelle prepared for I Morti - the Day of the Dead.